I've been meaning to go to Square Burger, Stephen Starr's burger outpost in the lovely, kid and mini-golf-laden Franklin Square, really I have. Yet Franklin Square remains a little isolated, if parking is any indication, and mini-golf has stopped ranking on my list of things to do since about seventh grade. All that being said, however, I do like the square, and the Square Burger, as it turns out. Mostly because of something called the "Cake Shake," a ridiculously tasty shake concoction that was described to me as a million tastycakes pureed with ice cream. Even if that description doesn't appeal, any lover of cake and ice cream will appreciate the shake. 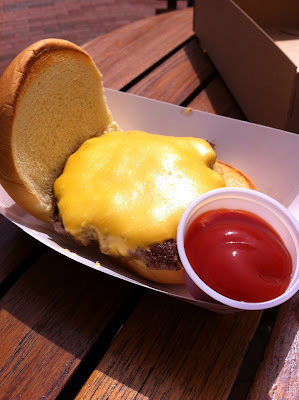 As for the burgers, I went with the Classic Cheeseburger. My reaction to seeing the burger was, "oh, it's an In-N-Out burger." The packaging, size, toasty buns looks like classic In-N-Out. However, I'll take In-n-Out over this, the California chain having mastered the buttery-tasting, toasty bun and burger proportion size a bit better than this outpost. Still a great theory, and this burger was actually a bit more meaty, but if you're going to style it like a classic, you should make sure it tastes at least as good. 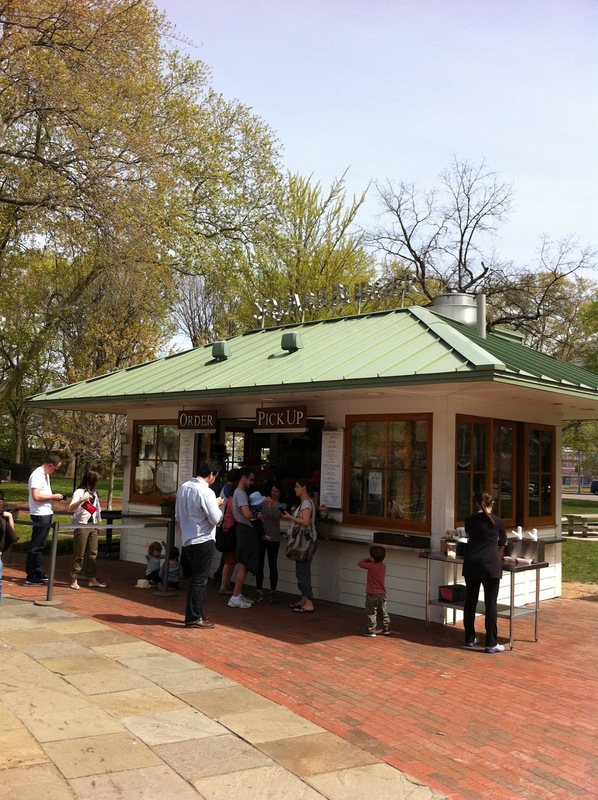 However, on a beautiful spring day overlooking the fountain, carousel and playground, I'll take my picnic burger and shake. Square Burger is located in Franklin Square, on North 6th Street, Philadelphia, http://www.historicphiladelphia.org/squareburger/. Breakfast for dinner can be one of those extraordinarily comforting meals that seems vaguely healthy while still satisfying a craving for something delicious. After traveling, well, a lot lately, I've decided this will be the week I claim some down time and cook as much as I can, even if it means just putting together a great salad. Off to the market I went, grabbing whatever fresh ingredients struck my fancy. And I came up with this dish, which hit the spot. You will need: 1 pack of assorted "gourmet" mushrooms, 1 leek, 2 eggs/person, polenta, pesto (fresh is best), white port (or wine), flour, butter, salt, vinegar, olive oil. Start by chopping the leeks and mushrooms and sauteering them with 1/2 tbsp of butter and some olive oil. Begin bringing a shallow pot of water to boil to poach the eggs. To the mushroom and leek mix, add about 1/4-1/2 cup of the white port/wine. Salt generously. As this blends, you may want to add about 2 tsp flour to absorb some of the wine and gel the flavors. Start sauteeing the polenta in rounds in a light splash of olive oil. As for the water, as soon as it boils, turn it down to a simmer, add a tbsp of white wine vinegar and then slowly submerge each egg, two at a time, depending on how wide your pot is. Turn off the heat to the water, cover and cook for 4 minutes. Plate the polenta first, then a bit of leek and mushroom hash. Then top with the poached eggs and light topping of pesto. In total, this dish takes about 15 minutes and gives you just enough chopping and stirring opportunities to feel like you've been "cooking." At least more than the microwaving you've been doing that's been passing for cooking. There are times in one's life where massive quantities of comfort food are in order. The day after my cat died, suffering from a sinus infection, I knew there was one place that could give me what I needed: Famous 4th Street. 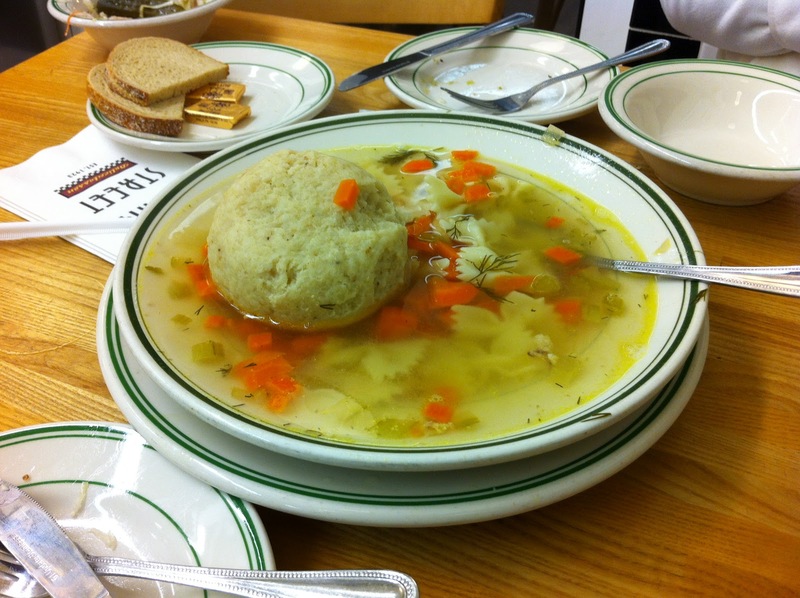 I wanted matzoh ball soup and several different forms of carbohydrates; I wasn't too picky about which ones. I knew Famous would have things in fantastical, Disney-like proportions, as though eating in the eighth Epcot country of overgrown Jewish delicatessens. Proportion-wise, I was spot on. 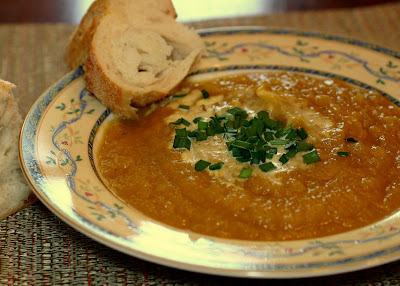 Taste wise, well, stick with the soups and bagels. The matzoh ball soup, pictured above, was amazing -- with white meat chicken and the matzoh ball being substantive without crossing the line in density. The grilled cheese tasted purely of butter and of this, I can never complain. The stuffed cabbage, serve with potato pancakes and kishka. Kishka, I asked? Our server was dubious, noting it was an acquired taste. It turns out to be sausage or stuffed intestine with a filling made of meat or meal (so says wikipedia) and a taste that I did not, in fact, acquire that evening. 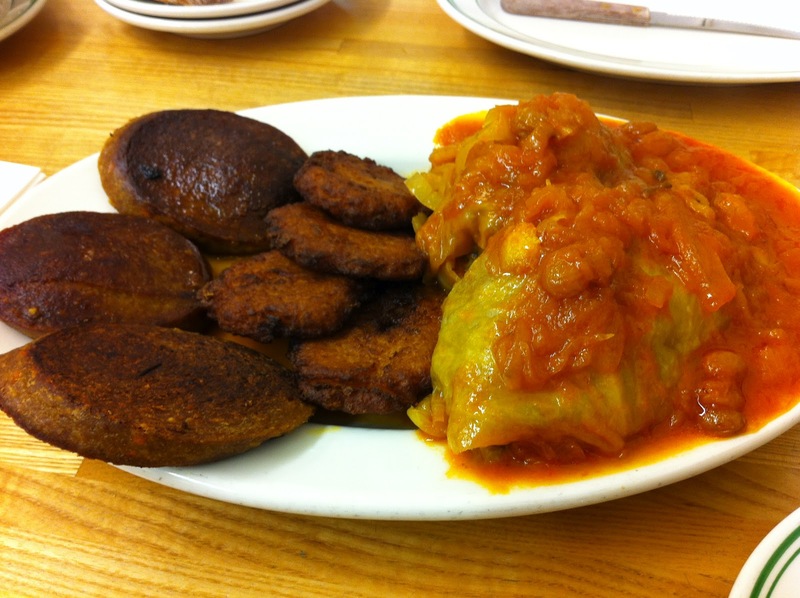 The stuffed cabbage was apparently done in traditional Jewish deli style, not in my traditional Pennsylvania Dutch grandmother's style, meaning it was bizarrely, sugary sweet. Not my favorite. We got some sides with our grilled cheese (did I mention the need for massive amounts of carbs?). The challah stuffing was also strangely sweet and the onion mashed potatoes, pictured left, while enough to feed a small army, were strangely less than great. Both simultaneously buttery and dry, the potatoes had too many onions for a skewed flavor balance that didn't work for me. 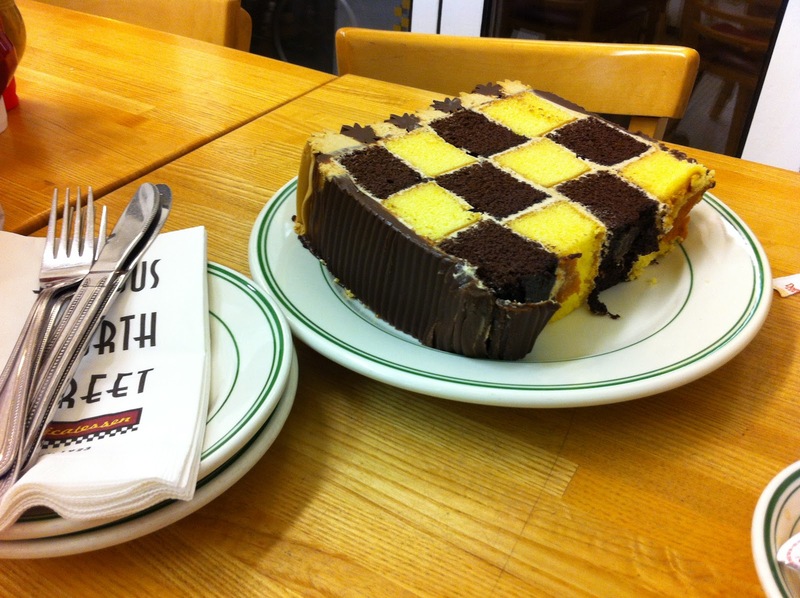 For dessert, however, after much debate and eschewing of the ever-popular black and white cookie, we opted for the checkerboard cake, with mocha-like buttercream frosting. It was the size of my arm and I ate leftovers from it for three days - after I split it with MDC. Really amazing, moist, tasty cake. 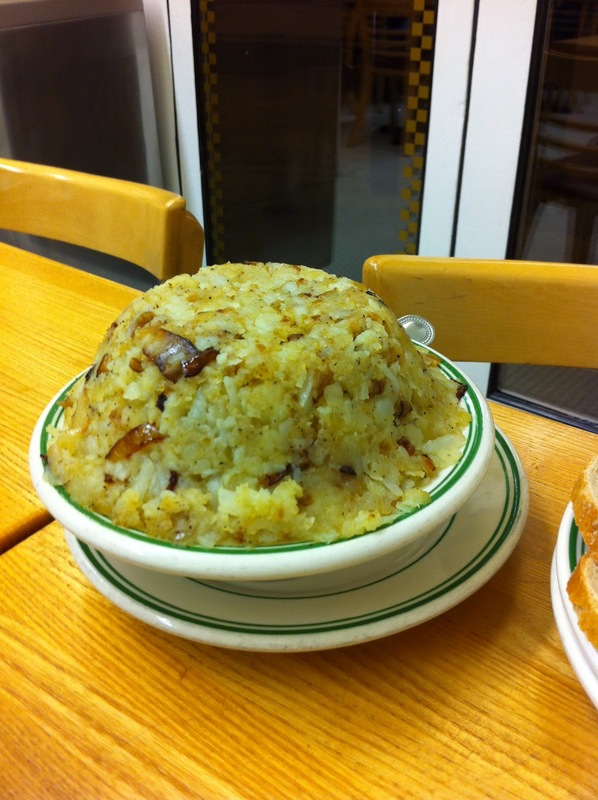 Famous 4th Street Deli is located at 38 S. 19th Street, Philadelphia, http://www.famous4thstreetdelicatessen.com/. There comes a point, in the middle of an east coast winter and a bad cold, after the Sudafed and Niquil and hot steamy showers have done some of their magic, where I can just begin to taste again. Where the only thing I want is the perfect bowl of pho. This time, I remembered the place I had been meaning to try, generally hailed as the being the best pho in Philadelphia: Nam Phuong. The atmosphere at Nam Phuong is a bit better than my old standby, Pho Ha, and the hours are better - 10 to 10 every day. Also nestled in a chaotic Asian grocery store strip mall on Washington Street, Nam Phuong turned out to be the respite for which I had been looking from the icy snow and my sinus infection. After a brief flirtation with predictably good summer rolls (with shrimp and pork), we moved onto the pho, with my opting for pho with eye round steak and well-done flank (yes, I know tripe and soft tendon taste better, but I was feeling less than adventurous), and MDC going for pho with beef balls, which the server kindly clarified to "meat balls." Arriving with all of the fixings of Thai basil, bean sprouts and sliced chili peppers, the pho satisfied my ultimate soup cravings. This was a broth that reflected the hours of preparation that should go into all good broths, with vaguely fragrant notes of cilantro, onions, ginger, beef, star anise, and clove melding into one profile that is both comforting and intriguing all at the same time. ﻿The beef itself was tender and flavorful, melding nicely with the hoisin sauce I dolloped on top. Of course it's pho, which in and of itself can feed a family for days. Coupled with hearty beef additions, MDC and I did our best to get through it in a couple of hours, with plenty left to take home. And a further abated cold. 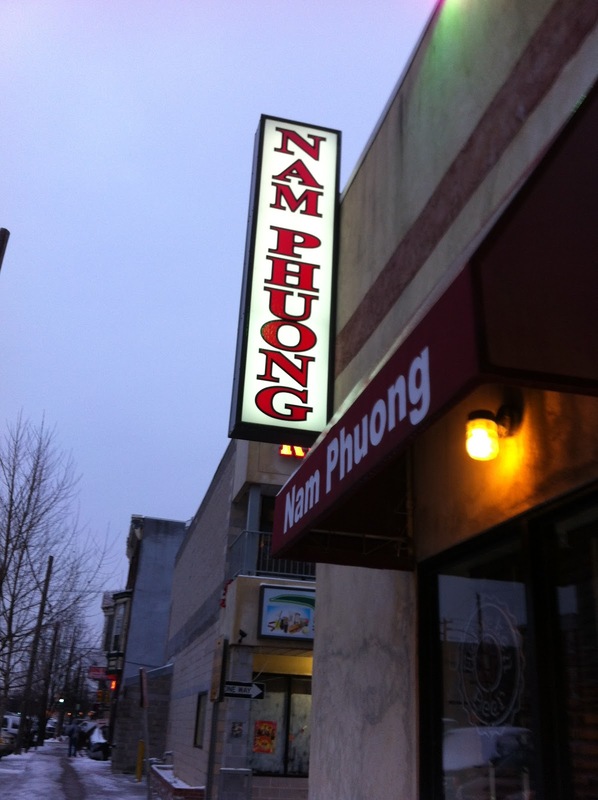 Nam Phuong is located at 11th and Washington Avenue, Philadelphia, Pa, http://www.namphuongphilly.com/. Food shows are ubiquitous; food discourse is esoteric. Which is to say I think that the Merriam Theater was packed full to see Anthony Bourdain and Eric Ripert talk because people like television shows about food. People are less likely to spend an evening out discussing whether the sustainable food movement is truly sustainable, hence why that packed full theater began slowly and painfully leaving about a half hour into the show. The exodus was distracting, but I got it -- a charismatic, cursing Anthony Bourdain talking about his mixed martial arts wife is one thing, but getting more academic about veganism in a global food economy, well, it's not a conversation for everyone. That being said, I thought it was fairly interesting. Juicy parts were discussed first, including coverage of why Eric Ripert hates "Kitchen Nightmares" (no one should be insulted at work, even when the insulter is Gordon Ramsay) and why Bourdain likes Ina Gartner (she tells people how to roast a chicken correctly, throwing in a funny comment about her marriage). Both described what they liked about Philly food, naming Marc Vetri and Michael Solomonov for chefs, and Amada, Parc, and Rouge for restaurants. Bourdain described how fatherhood may have mellowed him and that he is, in fact, a little scared of his wife. Numerous references to Alice Waters (influential California chef and owner of Chez Panisse) were made, with Bourdain ultimately concluding that her goals are good if not realizable, and that she is hard not to like (despite her "last dinner" wish of the very not-PC shark fin soup). Among the conversational tangents the two traveled included whether a chef should enforce his or her vision on their patrons, at the expense of the patron's own perceived preference. Ripert espoused customer service, emphasizing that the restaurant business is, first and foremost, a hospitality industry. That being said, he noted, it is ultimately a compromise between being true to the chef's own voice but making a dish accessible for its audience. For his part, Ripert serves his sea urchin topped with caviar. (I would order that). Bourdain chimed in that it's always a good idea to throw in caviar or shrimp on top of something new and different. The two opened the floor for questions. They were a bit stymied when asked about the glass ceiling for women (pleading ignorance, but also suggesting women have equal opportunities in the kitchen) and why there were few minority chefs. They also successfully dodged a somewhat creepy invitation from a woman from Matyson restaurant in Philly, inviting Bourdain for pigtails and bone marrow. And on veganism, Bourdain noted how being a vegan is an unfortunate restriction in some parts of the world as it would prevent one from enjoynig some food cultures altogether. Equally interesting was how truly charismatic Bourdain is. I was expecting the rough sarcasm, but he is a preeminent entertainer with an instinct for well placed wit and timing. Ripert is undoubtedly likable, with a sort of "oh shucks" Jimmy Stewart integrity of the food world, but he is a chef first. Even as a foil to Bourdain (and his best friend), his entertainment gravitas levels lacked. Bourdain and Ripert appeared together at the Merriam Theater on November 2, 2011. Something about cold weather inspires cooking. My go-to, feel-good, comfort winter food is squash. You can make it a million different ways, it absorbs any flavor you throw at it, and it walks the spectrum of sweet to umami. Having made a few squash soups, faced with an early Philly snow storm, and amazed at the dearth of people at Whole Foods, I thought I'd improvise a soup. Start with my favorite part: roasting the squash. 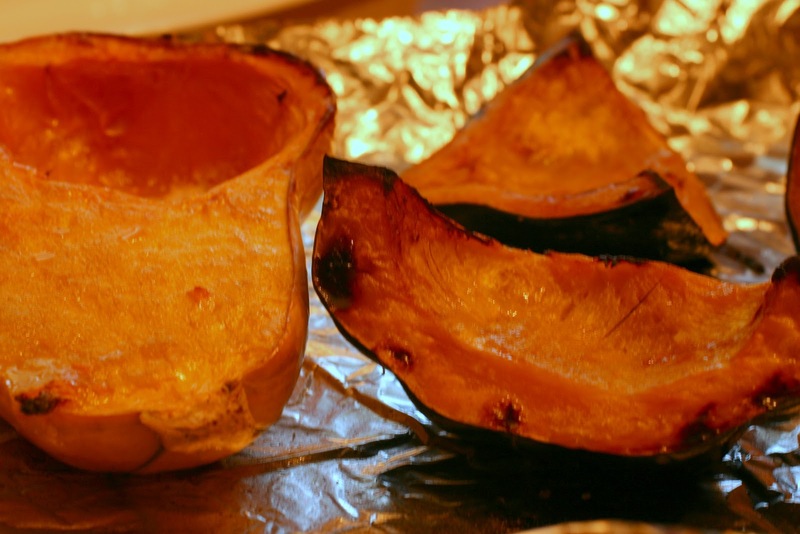 Quarter the acorn squash and halve the butternut, and try to minimize hand contact with the butternut. Drizzle and rub olive oil over the wedges and sprinkle with kosher salt. Roast in the oven at 375-400 degrees for about 40 minutes until caramelized. Catch up on episodes of "The Good Wife." Are you back yet? Okay, let the squash cool while you dice the onion and shallot. Dice whatever herbs you have; I used about two tablespoons fresh rosemary. Prepare a stockpot with a little olive oil over medium heat. 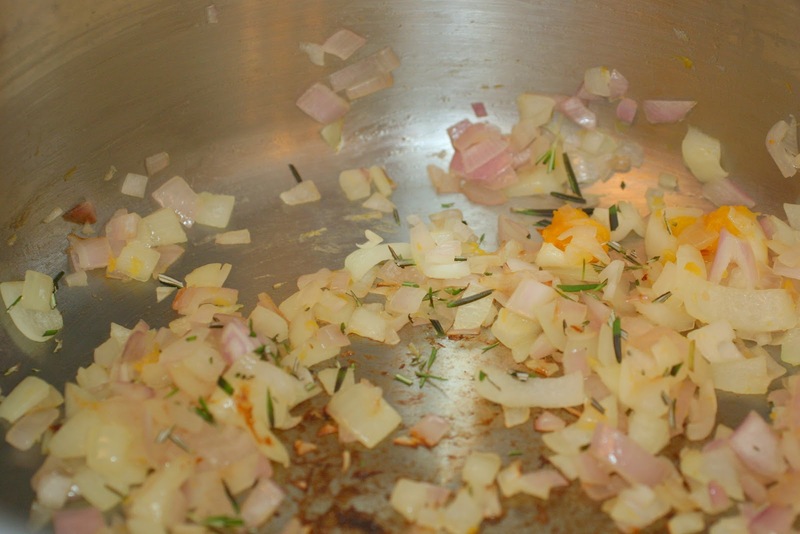 Add the diced onion, shallot and herbs into the oil. Saute until translucent. Ponder the spelling of the word "translucent." As this sautes, scoop out the flesh of the squash with a spoon; it should be that soft at this point and cool enough to handle. Add the squash flesh to the onion mix and saute for about two minutes. Then add the vegetable broth to your desired consistency -- I ended up adding about 2.5 cups for a fairly thick soup. Finish in a blender or with an immersion blender to your desired texture. I garnished with a little cream and garlic chives for the sake of the photo -- you don't need them (especially the garlic chives, which are, in fact, very garlic-y). Add an artisan baguette and beer, and welcome in the cold. Lately, there seems to be an outcropping of what I like to call ambitious restaurants. You know the type -- they feature sometimes unidentifiable, exotic ingredients with at least one foam or gelee and manage to cram 10 of these type of ingredients into a 2" x 2" section on a 12" plate. Don't get me wrong, I fancy myself ambitious, too, and I'm all for fresh, unique taste combinations. But if Mica and Noble are any indication, Philly doesn't always pull off the ambitious restaurant, leaving my disappointment in its wake. Blackfish restores my faith. 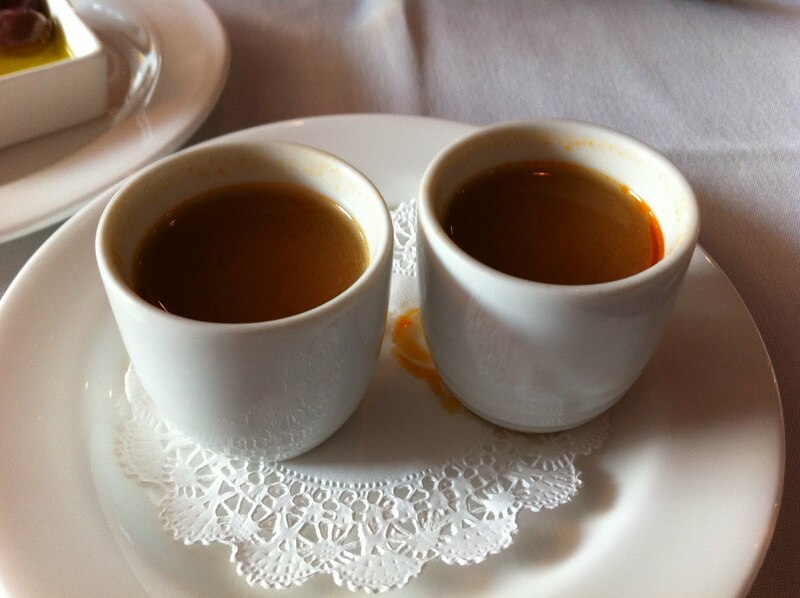 It delivered the goods, pleasantly surprised my palate and remained down-to-earth but professional in its service. Best of all, it is BYO and usually offers Tuesday night tastings. After enduring a number of $65 Jose Garces email offers for Chifa empanadas with Dogfish head tastings (yeah... but for $65? 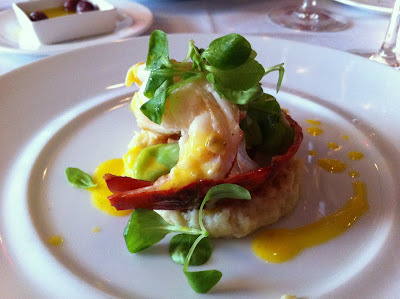 ), TFRB and I jumped at the "Lobster Tasting Menu" email when it arrived. And here's what we got: 5 courses of lobster based dining (dessert was not lobster based, thankfully) for $45. The first of which was this lovely amuse bouche of lobster broth that did what it was designed to do -- whet our appetite for more lobster (as if we needed prompting). 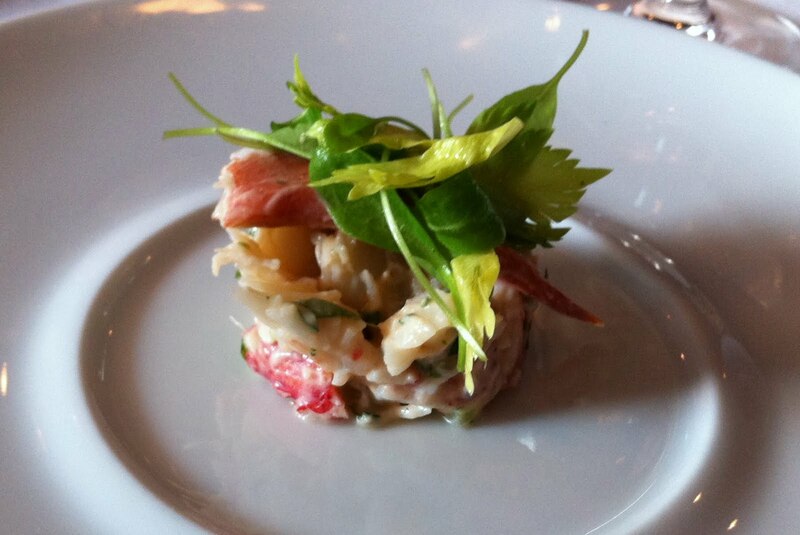 The lobster salad with celery and tarragon also delivered its objective -- highlight the lobster itself with just enough background flavor to enhance the meat and make the salad cohesive. 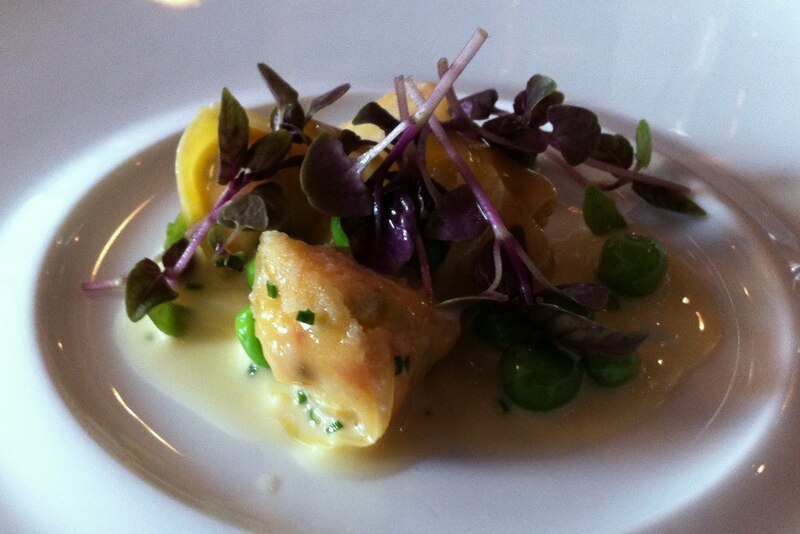 The next course, lobster tortelli with english peas and beurre fondue, offered a nice pop of lobster flavor, but the fresh peas in cheesy butter was close to tempting me to lick the plate. The crowning achievement was of course the roasted lobster tail, pictured above, with "'creamed' corn" and saffron-vanilla. Not sure exactly how the heavenly cloud on which the perfect piece of lobster was perched had been formed, but I didn't care, I just enjoyed. 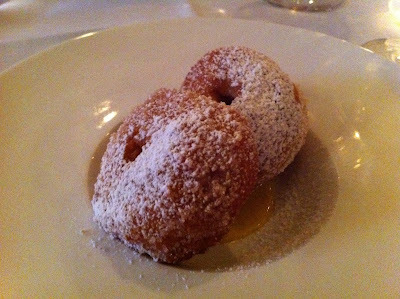 The caramel beignets with english cream were a pleasant, albeit unnecessary end to the meal. TFRB, a bit of a beignet connoisseur, placed them somewhere between "very good" and "New Orleans." Despite my seeming indifference, I managed to eat ... every bite. What can I say? Thank you, Chef Chip Roman for living up to the hype of the restaurant and offering such awesome deals that would lure a city dweller to Conshy and exceed her expectations. And as for you, faithful readers who are not my parents, get on the email list to get the Tuesday tasting announcements when they happen. Oh heck, my parents should, too. Opinionated eater who enjoys Philadelphia's restaurant scene and the occasional home-cooked meal.